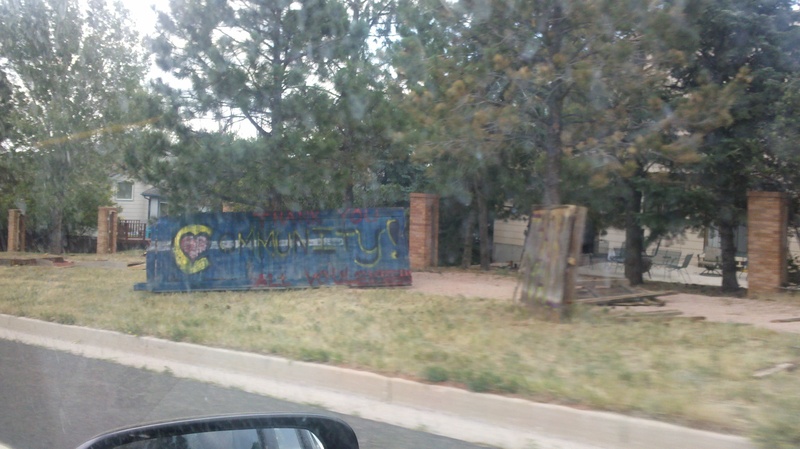 Waldo Canyon Fire – S.D.G. 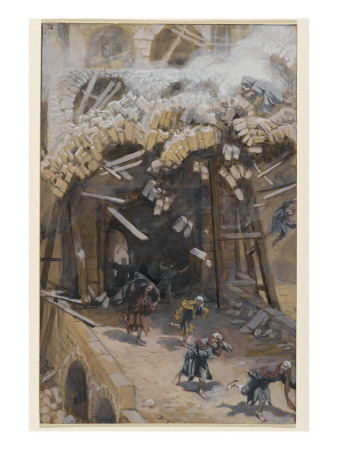 How should a believer respond to catastrophe? We’ve all heard the question: “Why do bad things happen to good people?” It’s a good question, and the answers are difficult. 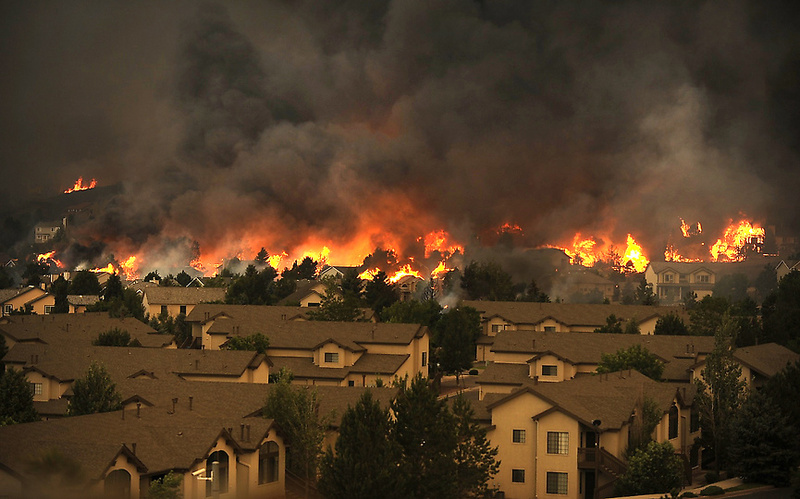 Our pastor addressed this last Sunday to a congregation of people who had recently been through the hell of the Waldo Canyon Fire. Many of us in the church, like me, were evacuated and feared losing everything but were spared. At least three families that I know of did in fact lose everything. What do we do with this? I highly recommend taking 40 minutes and listening to his sermon “Certain Hope.” This link leads to a site where you can either download the sermon or just hit the play button and start listening. His words were incredibly comforting to me this week. This is perhaps not a very popular passage. Before this Sunday, I don’t think I had ever heard a sermon preached on it. These words of Jesus pierce “to the division of soul and spirit” (Heb 4.12) and force us to confront some of our delusions. Our delusion about our own guilt and innocence before God. Our delusional judgment that others merely receive their comeuppance. Even the delusion that, even though others aren’t, I at least am basically “good” and therefore untouchable. I’ve had this overwhelming feeling throughout the week as I clean and put our house back together that I have been spared. 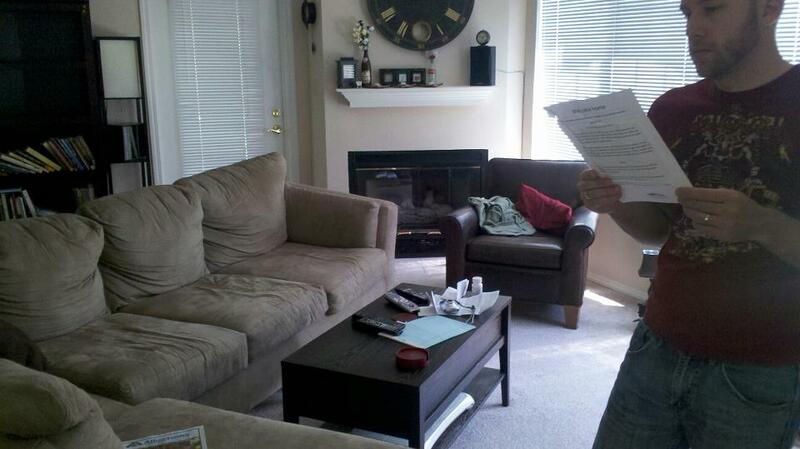 I sat on our couch and realized how incredible it was I had a couch to sit on. I sat at our dinner table, working on a quilt, and marveled that I still had this table to work upon, when not so long ago I counted it all gone. It is difficult to express such deep, profound gratitude in words. There are just no words for it. God, in his wise and provident grace, spared me, my family, and even our house and belongings. But that begs the question, what if he hadn’t? Ultimately I rest on the confident assurance that my life is hidden with Christ (Col 3.3), so though he slay me, yet will I hope in him (Job 13.15). But that brings me back to the “why?” What does this all mean? Those who were killed by the Roman troops and those who died when the tower fell may have been upstanding citizens. But in the vertical dimension, in their relationship to God, none of them was innocent, and the same is true for us. Jesus was saying, “Instead of asking Me why a good God allowed this catastrophe, you should be asking why your own blood wasn’t spilled.” Jesus was reminding his hearers that there is ultimately no such thing as an innocent person (except Him). Thus, we should not be amazed by the justice of God but by the grace of God. We should be asking why towers do not fall on us each and every day…. I have been spared not because I deserved to be spared. The reality is that I have sinned, and therefore I deserve the harshest catastrophe in judgment. But by the grace of God through the work of Christ, I have been spared – not only this fiery catastrophe, but the eternal fiery judgment to come. My hope is built on nothing less than Jesus’ blood and righteousness. I want to share this video with you taken by the audio/visual department of the Colorado Springs Fire Department. This footage is incredible, and it gives you a real sense of just how much the agencies who fought the fire that night did to save homes and hold the fire back. I want to highlight three parts of this video. First, around 3:35 you see the house I mentioned in my last blog post – the one just over the fence from our neighborhood. As sad as it is that they could not save that house, they were able to stop the fire at the house, saving 195 homes near it – including ours specifically. Next, I want to highlight around 6:45, when they show the breath-taking footage of the burning of the Ashton Park neighborhood. 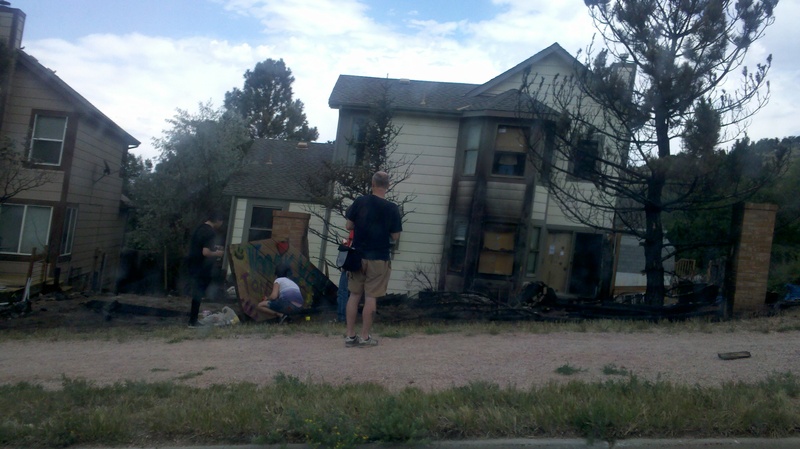 The is the neighborhood where I saw the man clinging to his charred mug. It is devastatingly sad, yet you can also see how hard they worked to save as many homes as possible on that road, and how they held their ground on Flying W Ranch Road. I am incredibly grateful for that line of engines, because this neighborhood is just across Flying W from our own. In two very real ways, I can specifically appreciate and be profoundly thankful for how these men saved my own house. Finally, I love the way this video ends around 11:03. Can you help cheering when a new, not-even-sworn-in firefighter puts out a roof fire with a garden hose, saving a house? I cheered out loud. Please watch this video. Please share it. Say a prayer of thanks for these men and what they did. Home sweet home. Part two. Hopefully the last part. We visited our home today and were amazed at what we found. It was like nothing at all had happened. The garage smelled a bit smoky, but barely, and I noticed nothing inside the house. I keep walking around smelling the furniture, the towels, the carpets, the shades. Nothing. It smells like a house. No more, no less. And during our visit today, we found out we could come home tonight after 8. Permanently. Finally. So here we are. 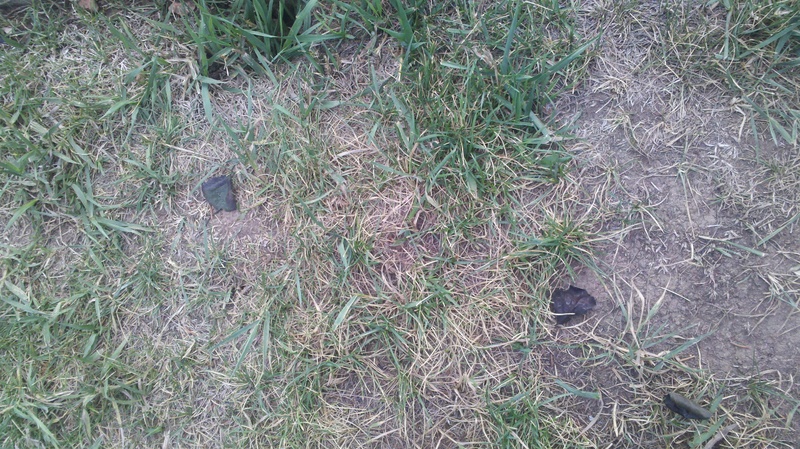 What we found when we came home. Aside from the fact that it looks like we robbed ourselves, the house was just a house. Hubby’s reading the utilities info that was tacked to our front door. It is dumbfounding to us how supernaturally ordinary our house was today. We were anticipating soot, ash, smoke, and an awful mess in the fridge and freezer, but as my husband is reading in the notice in the above picture, we found out that we had not lost utilities long enough for the food in our fridge to go bad. There is some food that we will need to throw away – food that was sitting out, so we don’t trust it in case smoke did get into our house at some point and then air out over the week. Our water is clean and drinkable, our electricity and AC are back on. The only utility missing is natural gas – read that “hot water.” But we anticipate having someone come by tomorrow during the day to help us turn that back on. Incredible. 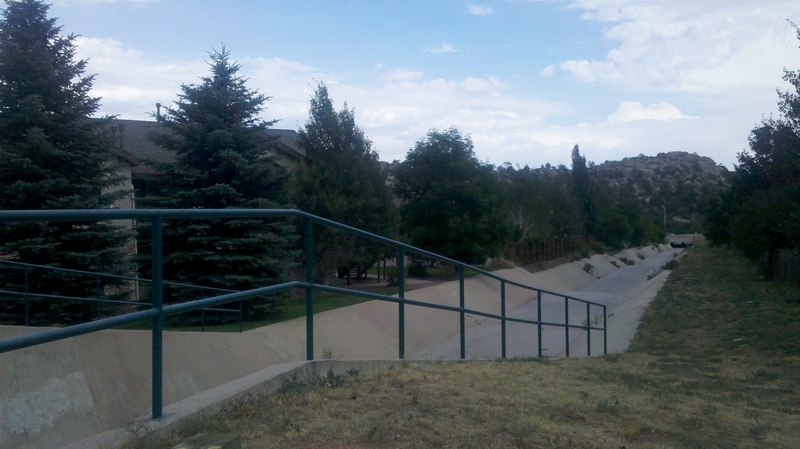 We also used the opportunity during the visit this afternoon to take a walk through our neighborhood, and then briefly drive through the rest of Mountain Shadows while it was still open. Many parts of the area went back into mandatory evacuation this evening, so we wanted to know what had happened while we still had a chance to check it out. What we saw was sobering. I took a few pictures, but at the same time I sought to treat this area with enormous compassion and respect. For that reason, I’ll refrain from posting most of the pictures, and just show you a few to give you a very basic idea. This small drainage ditch is all that was between the closest burned out house and our own town home complex. It is as if God put his hand there and said, “No further.” I can’t imagine why. I don’t understand why their house burned and ours didn’t. I have to admit, I’m going through some weird version of survivor’s guilt. I almost feel guilty that I’m able to sit at home on my own couch tonight when they can never return home. My heart breaks for them. I also looked down and noticed burned leaves. It stopped me short as we walked. I just didn’t expect them. Finally, I would love to show you a picture of just how scorched the ground is. These beautiful hills used to be covered with the most amazing evergreen forest. The trails and views throughout these ridges were breath-taking. Now they are heart-breaking. I look forward to the regrowth. I know that just a few years from now it will be even more beautiful than before. Fire has a way of cleansing and resetting. For now, however, it is a sad sight. I’ll leave you with an image of hope. 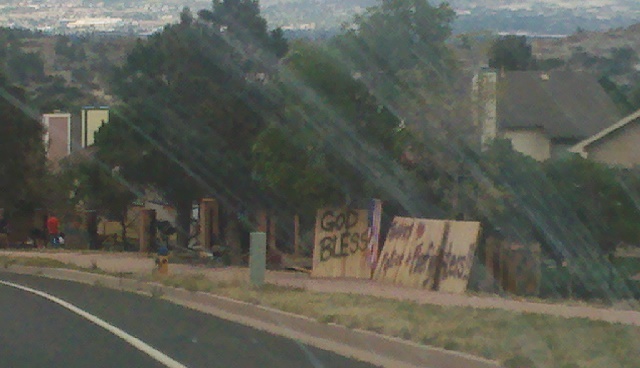 As we drove back out of the neighborhood, we saw these signs painted on torn-down sections of fencing. 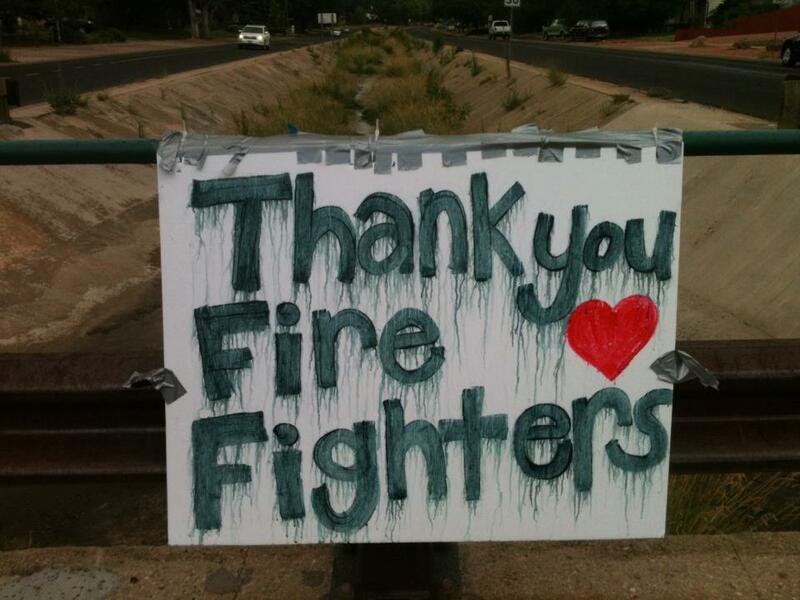 We are truly grateful to all the firefighters. It was so clear today that they saved our home. They really are our heroes. So what’s next? I never thought I’d hear myself say this, but I feel housework deprived. I’ll spend the next several days deep-cleaning everything, rearranging furniture, getting the house back to a normal state. And I plan to get rid of a lot. For example, I left behind quite a bit of clothing and two full boxes of books, hoping they would burn so that I could get the insurance money. I figure, if I need that stuff so much that I actually wish for it to burn, it’s time to pack it all up and donate it to Good Will or something where people who do want it can get it. Going through an evacuation like this kinda inspires one to simplify. I’m also going to spend a lot of time reflecting. I saw the face of a man today who visited the rubble of his burned out home. He clutched one small, charred mug in his hands – like it was the only thing he could recover – even though it wasn’t important enough to him to take it during the evacuation. His face will haunt me. His sorrow. His clinging to the only thing left from his former life there. I don’t know his name but I find myself in desperate prayer for him. I also need to work through my own mixed emotions. I still can’t really believe our house is here and in almost perfect condition; I was so sure it was gone. Someone at church this morning put it perfectly when she said it was like God asked us to give it all up, and then gave it all back. I never faced death but it’s like I have a new chance at life. I want to really make an effort to get to know my neighbors. We all have this common experience now – there’s something to build on. Another friend had the great idea to hold a neighborhood picnic. Give people the chance to get together, meet each other, and share their stories. Like me, so many others who have had these experiences this week just want to tell their stories to someone – someone who understands, someone who isn’t going to talk about that fire they heard about ten years ago in Arizona, someone who also cried and feared and grieved this week, someone who also is grateful to have their home and life back. It’s a chance for us to share why we hope, to share our confidence in the One who lost more than we ever could just so that we could have everything He ever deserved. I’m drawn to the phoenix right now – the mythical creature that rises from the ashes. That’s exactly what is happening in Colorado Springs right now. There is hope. There’s life beyond the catastrophe. 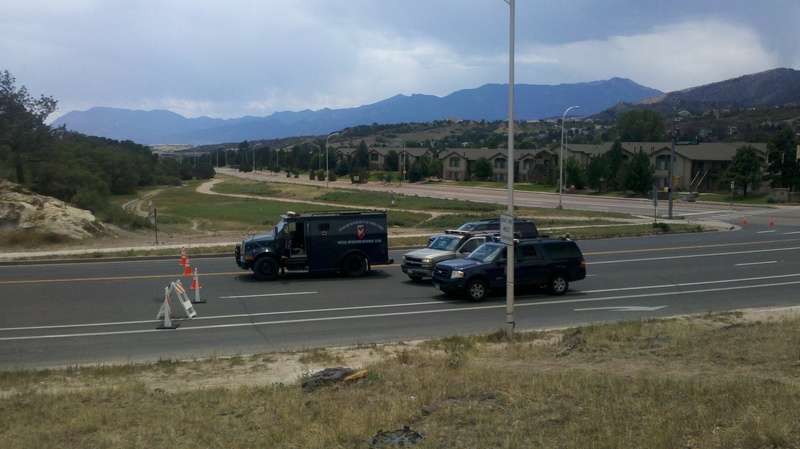 Police blocking the entrance into the Mountain Shadows area. We are still under mandatory evacuation, but the fire is already 45% contained! It’s getting easier to be more and more optimistic. Currently our little corner of a neighborhood is still just barely in the mandatory evacuation zone – partly because it is so close to the burn zone, and partly because CS Utilities has not yet verified that the gas mains are safe and operating. But earlier today I was out and about with my friends Sarah and Polly (both of whom also were evacuated but had their evacuations lifted yesterday) and we decided to drive up to the parking lot that was catty-corner to my neighborhood and look across the intersection at my complex. I could not see our specific building, but I could see that all the town homes were standing and looked normal. It was very encouraging. Our townhome complex. You can’t see our specific building here, but all the buildings around it look perfectly normal from this distance. The hills behind our neighborhood, however, have definitely changed. All that to say, I’m excited and optimistic, but also pretty nervous. It will be so nice to see the inside of our own house again, but we’re still not sure what we’ll find there. It will be encouraging to see that it’s still there and (hopefully) fairly normal, but also frustrating to have to leave again by 6:00. So many mixed emotions… they say it could still be weeks until the gas mains are secured and capped off – that is, weeks before they let us back in permanently. Yesterday was a huge day for closure. Those who lost their homes had their losses confirmed. Many of the evacuations were lifted and thousands of people went back home. And we received the awful, sad announcement last night that a body had been found. The fire had claimed a life. Moreover, this morning the news about the fire itself was positive: the humidity in the air is helping, the wind is letting up, the fire is 15% contained, the total acreage decreased from over 18,000 to around 15,000. Things are looking positive again. It’s still not over though. The media keeps reminding us that there’s an “active” wildfire out there. 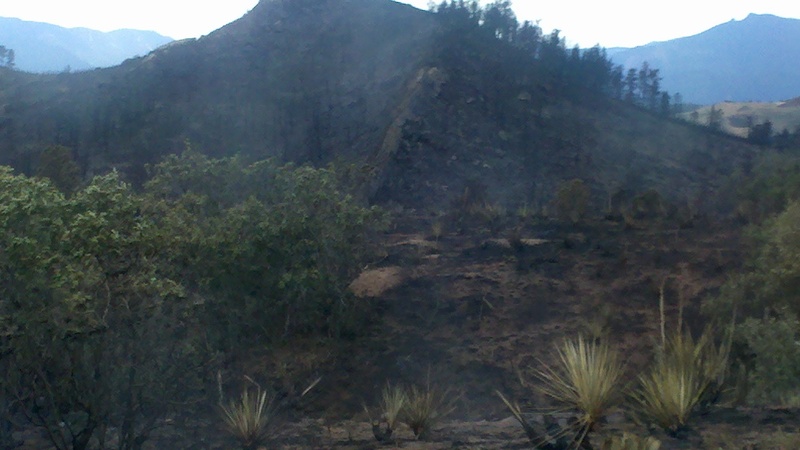 There are still smoldering hot spots, even in the Mountain Shadows area. Many of us from those neighborhoods still can’t return home – and may not be able to for a while yet. At the very least, our houses have had no utilities since Tuesday (which makes me dread cleaning the milk, eggs, cheese out of our fridge…) and will not have natural gas for a long time because of the safety checks required before it is turned back on in the area. The entire affected area still needs to be surveyed for damage, structural stability, hot spots, and (hopefully no more) remains. Yet, life moves on around us. We’re still crashing in our friends’ guest room. Austin’s still working on evaluating whether his store can open back up. We’re still hanging on the announcements of the press conferences throughout the day. We’re still anticipating smoke or water damage to our (thankfully) still-standing house. But last night, after the most somber presscon so far with the announcement of a casualty, I saw the first sports reports in days. It felt so out of place, so ordinary. Almost silly. I had forgotten that daily life has gone on around the rest of the world because our world has been so consumed by the minute-by-minute details of this fire for almost a week now. But it was a ray of hope. Something as small and simple as a sports report. It’s a news segment I never watch in real life – if I watch the news I’ll catch the headlines and the weather and then change the channel. But I watched it last night because it reminded me of the light at the end of the tunnel, that it’s getting closer. There has been so much bad news and so much good news. Thousands of lives have been forever drastically changed. And still life goes on. We look forward to the swift containment of the fire, to the return to our homes, to the rebuilding of what has been lost. 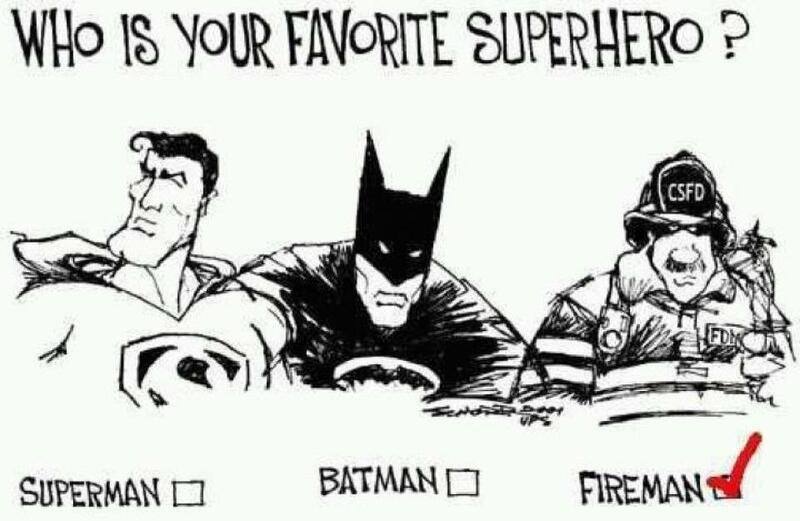 And we cannot thank our firefighters enough. Truly, they are our superheroes. I am exhausted. I slept until about 10:45 this morning, and just awoke from a nap this afternoon. We have reason to believe our house is actually still standing. 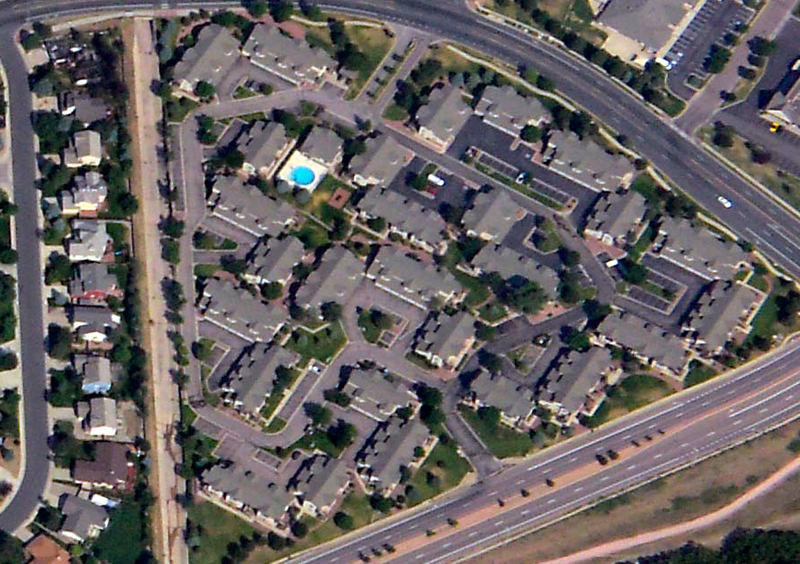 The aerial photo below is the most recent picture we have of our neighborhood. It is a very small crop from a large aerial picture that does show many of the 346 homes that were destroyed in a mere matter of hours on Tuesday. The image is breath-taking, devastating. I intentionally cropped out the homes so near to ours that were destroyed. I feel like that is not my image to publish. It’s too personal. It seems like it should be more private, not displayed all over the place. The most recent image of our neighborhood. I have very mixed feelings right now. I’ve already been through so much of the grieving process. I’ve been living with the very firm assumption that our house was burned to the ground. And now suddenly – hooray it’s there. As crazy as this might sound, it would almost be easier if it wasn’t. This fire is finally 10% contained, but they are predicting it will take until July 23 to contain all of it. The weather conditions are still not incredibly favorable for the firefight. Anything could still happen. 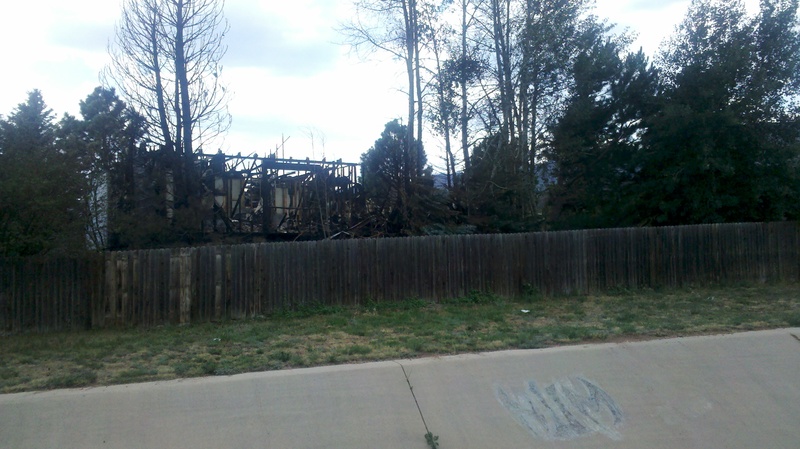 Though it is standing today, there is no guarantee our house will be safe from the blaze tomorrow, or the next day. That sounds bleak, I know. I’m sorry I’m not more optimistic. Now what do we do? We can’t go home yet. The area’s not open and we have no idea when it will be. Just because the building isn’t burnt to rubble doesn’t mean there isn’t smoke damage or damage from water or fire retardant. We also know that there have been a handful of opportunity crimes: theft and property damage within the evacuation zones. We just have no idea. I certainly will be grateful not to lose the things we left behind. Over the last 24 hours, we’ve remembered this gift or that souvenir that we forgot to grab. At the same time, do we really want to live in an area where there is a constant visual reminder around us of our experiences this week? Can we even break our lease and move if we want to? I have so many more questions today than I did yesterday. I’m thankful and hopeful, but cautious and hesitant and conflicted. I also grieve for those who will be at a private meeting tonight, finding out for certain that there is nothing left of their houses and belongings. Finding out that they have no home to return to. I cannot imagine what that meeting will be like. I hope and pray that the media standing outside the door will treat those families with incredible respect and compassion as they go in and come out tonight. Again, thank you so much for the prayers and messages and calls. We are so blessed to have such wonderful friends and family. The fire above our beloved city. We’ve had so many people offer prayers and condolences. Many of them said they just couldn’t imagine what we’re going through. Honestly, I don’t know if I could truly describe it in words, but I thought I’d try. This experience has gone through many stages – for me, most of them emotional. For you counselors out there who’ve been reading, you’ve probably recognized the stages of grief. On Saturday when we first evacuated, I was in denial. We packed everything and got out, but my attitude was optimistic. I thought there would be no way our house would burn, we’d be just fine. In a day or two we’d move back home and everything would go back to normal. Just a minor blip of disturbance on the otherwise stable pattern of life. 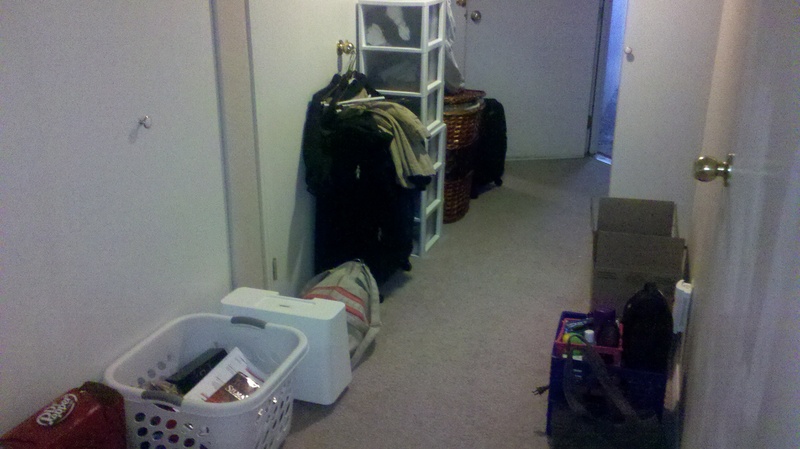 And we did move back home Monday night, which increased my confidence that we would be just fine. Tuesday, though, when the fire began acting up, I began to experience fear, distress, severe anxiety. I had the first (two) anxiety attacks of my life. I went back and forth between these two emotions like a roller coaster for several hours. One moment I would be screaming and crying in anger and frustration at something. 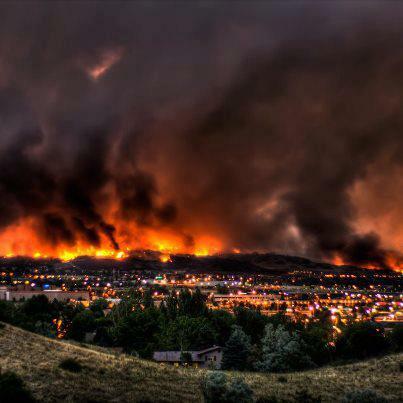 The next I was paralyzed with panic – especially when I first saw the flames pop over the ridge toward our neighborhood. Finally last night I was overcome with sadness. The anger and fear have dulled away and I’m mourning the loss of the beauty of our landscape, the loss of our neighborhood, possibly the loss of our house, definitely the loss of our comfort and stability and routine. 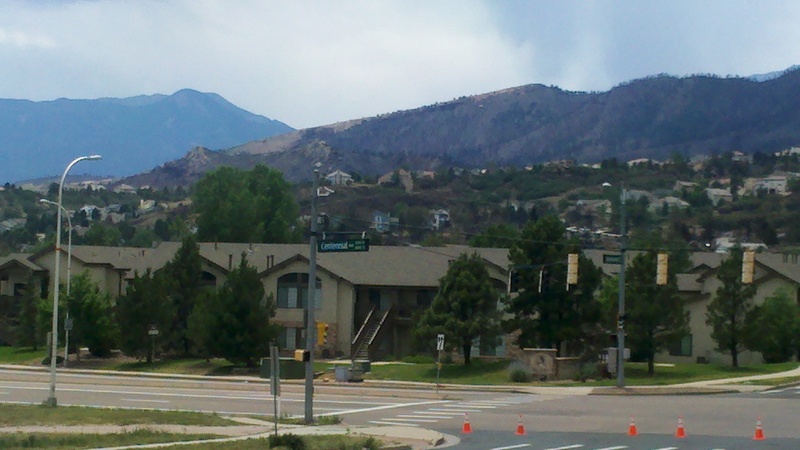 The town homes in the front half of the picture are where we live. The flames and smoke look like CG, but I promise they are very real. And then there is the wrestling with imagination and questions. I had to fight to stop thinking through every room in our house last night – picturing the things we left behind, imagining what they would look like as they burn. The flames are too big. The fire too imminent. The questions too big. I’ve avoided asking the question “Why?” It’s just too big of a question. The questions I do allow myself to ask are questions of moving forward. We are assuming, for the sake of coping, that our house is in fact gone – though we have no way to confirm that right now. Many structures have burned. Many have been saved. We have no way to know which ones are which. I look forward to the “upward turn” stage of grief: the rebuilding, the hope, and the vision for life beyond the loss. We’re starting to work through questions like, “Where will we live?” “Will Austin’s store still be standing and what will work look like for him?” “What will we focus on replacing first?” “How helpful will our insurance be?” It’s hard not even being able to picture our furniture in a new place. Yet. God is so faithful. I’ve had three passages running through my mind over and over during these hardest hours in my life. I put one at the top. I do keep lifting my eyes to the blazing hills. It’s so easy to despair when your home looks like a special effects scene in an apocalypse movie. (As my husband pointed out, though, props to all the special effects teams out there – we never realized just how realistic those unbelievable scenes are.) Yet I know God is the maker of all heaven and earth. He knows every inch of this fire. He knows every fuel source. He knows the complete path of destruction, the total loss, every particle of smoke, and the name of every one of the 1000+ firefighters, the name of every one of the 32,000+ evacuees and their pets and belongings – even the number of hairs on each of their heads. He is good. He helps his people. He will be glorified. Our sermon on Sunday was on the Lord’s prayer – often a mantra that we repeat without thinking through. It has become so real and personal. Our Father – you know us, love us, care for us, mourn with us, empathize with us, comfort us. Who art in heaven – you know all, see all, control all, understand all, work all to your purposes and good. Give us our daily bread – we cry out for even physical provision, we depend on you for our most basic of needs, we cannot survive a moment without your help, your provision. Your will be done on earth as it is in heaven – there is a reason, a plan, a purpose, this is not wasted or random or meaningless. Finally, we are overwhelmed with how God works through his people. We are so loved, so cared for, so provided for, so comforted, encouraged, and prayed for. Despite losing so much, we want for nothing. Even people as far away as Seattle, the South, and Canada have offered whatever help they can give. All of you, you are truly the hands and feet of God working in our lives right now. God bless you for your hearts and may he hear your prayers on our behalf.